The Korean War (1950-1953) was a bloody conflict. It left Korea, North and South, with several million dead and the UN forces (led by the US) involved in the fighting with over 100,000 casualties. But despite fighting as intense and as violent as any other conflict since World War Two, Korea has always been history's 'Forgotten War'. The US to this day refuses to sign a peace treaty with North Korea - thus the war legally continues. On July 27, 1953 the US signed an Armistice (ceasefire) with North Korea but that is it. Thus the continuous US-South Korean war games right along the North Korean border must make Pyongyang wonder - is this the real thing? Did the Pentagon decide to invade us for real this time? North Korea has seen the US since 1953 invade and destroy Vietnam, Dominican Republic, Iraq, Granada, Panama, Yugoslavia, Afghanistan, Libya, Syria, Somalia, Haiti, Yemen and others that don't immediately come to mind. The Koreans called it the 'American War'. The US bombed virtually every standing building in North Korea forcing the people to live in caves. They came out at night to tend their gardens so they would not starve. North Korea is not crazy. They've faced down the unforgiving military boot of the US and are determined not to surrender. Their constant bluster is really a strategy to get global attention to help intervene on their behalf to restrain Washington. 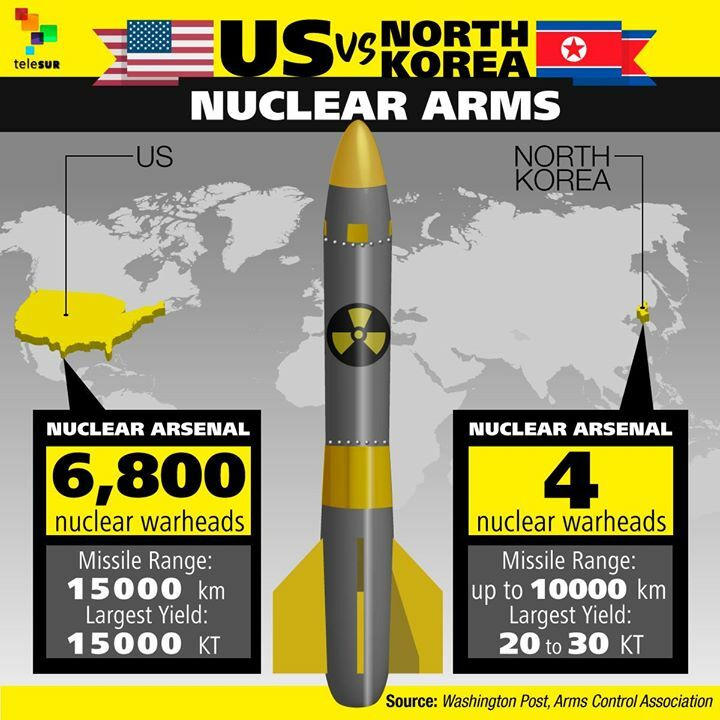 In a new report, published by the Bulletin of Atomic Scientists, missile experts (including Ted Postol from MIT) write that North Korea does not have the rocket capability that Washington and the corporate media are claiming. They state, "The Hwasong-14 does not currently constitute a nuclear threat to the lower 48 states of the United States. The flight tests on July 4 and 28 were a carefully choreographed deception by North Korea to create a false impression that the Hwasong-14 is a near-ICBM that poses a nuclear threat to the continental US. The Hwasong-14 tested on July 4 and 28 may not even be able to deliver a North Korean atomic bomb to Anchorage, Alaska." War on the Korean peninsula would go global. China has announced that if the US attacks North Korea it will defend Pyongyang. The people of the world must speak out now loud and clear. No war on the Korean peninsula. Stop US war games and close the US military bases. End the US military colonization of South Korea. Exclusive interview with BDS activist Roger Waters (Pink Floyd) discussing fake news, US-Russia relations, war and Palestine. I was interviewed on RT today. Here is the video. 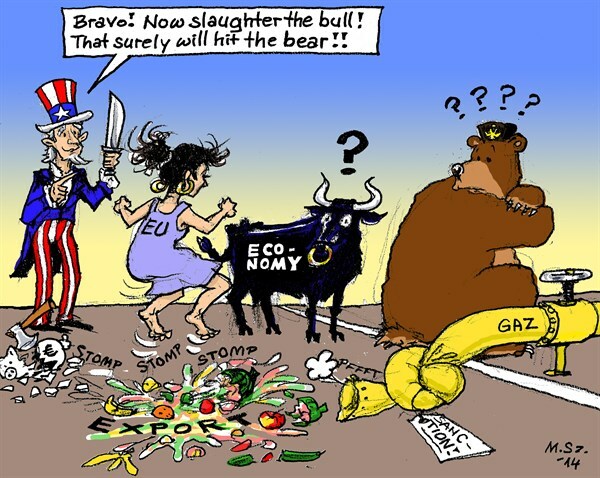 The US is preparing the American people for something - who knows what? First-strike attack on North Korea? Maybe a false flag operation to justify the US attack - that is historically our Modus Operandi. Speak out now while we still can. The crazies are pushing this hard. Some years ago I heard of an organization called the Military Religious Freedom Foundation (MRFF). They've been investigating the growing dominance of the US military by Christian fundamentalists who see the Battle of Armageddon as a good thing that would bring on the 'final days' and the return of Jesus Christ. Embedded deep beneath the country's mountainous zones are some 200 varieties of minerals, including gold, iron, copper, zinc, magnesite, limestone, tungsten, and graphite, Quartz reports. WASHINGTON (CNS) — Saying the possession, upgrading and potential use of nuclear weapons was sinful, peacemakers gathered outside the White House on the feast of the Transfiguration and implored the U.S. government to empty its arsenals and embrace a world of peace. “Nuclear weapons are immoral, illegal, anti-God, anti-life, anti-creation and have no right to exist,” Art Laffin of Washington’s Dorothy Day Catholic Worker community told the gathering Aug. 6, marking the 72nd anniversary of the atomic bombing of Hiroshima, Japan. 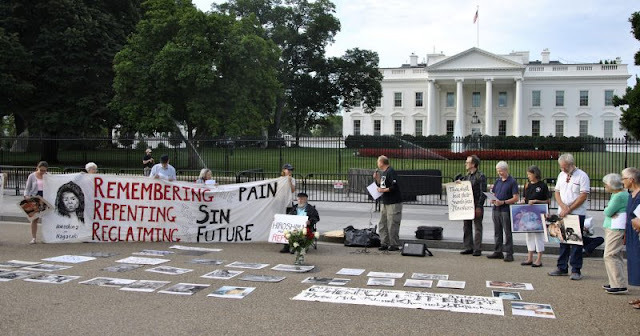 Laffin urged the group to recall that the anniversary was a time of “remembering the horror, repenting the sin and reclaiming a future without nuclear weapons” during the one-hour vigil just after sunrise. The group included members of Catholic movements working to end nuclear weapons. They had gathered to “apologize” for the Hiroshima bombing, and for the bombing three days later of the Japanese city of Nagasaki Aug 9, 1945, both of which culminated in the death and maiming of hundreds of thousands of people, the peacemakers said. Participants were invited to recommit their lives to “disarming and dismantling the machinery of mass destruction” and offered an apology to bombing survivors, known as Hibakusha. Red and white roses were distributed to participants during the event. The red roses were said to symbolize the sacredness of life and the grief and suffered caused by war and the atomic bombing. The white roses were said to symbolize hope and the commitment to work for a nonviolent world. “If the U.S. is to ever truly lead the way to real disarmament, it must first repent for the nuclear bombings of Hiroshima and Nagasaki. Then and only then can the U.S. legitimately ask other nuclear nations to disarm,” he said. Since the end of World War II, U.S. and political leaders have maintained that nuclear weapons are necessary and serve as a deterrent to potential attacks from other countries. The peacemakers planned a second vigil Aug. 9 at the Pentagon to recall the anniversary of the bombing of Nagasaki. By Will Griffin from Veterans For Peace and also newest board member of the Global Network Against Weapons & Nuclear Power in Space. Well done Will - great report! Donbass News Agency reports that the US has begun constructing a maritime operations center at the Ochakiv Naval Base (just south of Mykolayiv Oblast) in southern Ukraine. Ochakiv is located close to Crimean peninsula and Ukrainian 73rd Naval Center of Special Operations is situated there. US Seabees held a groundbreaking ceremony for a maritime operations center on July 25. Beginning construction in Ukraine is "a significant accomplishment," said Lt. j.g. [junior grade] Jason McGee, officer in charge of Detachment Ukraine. "Our ability to maximize European reassurance initiatives in Ukraine holds strategic importance, and will ultimately improve host nation defense capacity and infrastructure, strengthen relations and increase bilateral training capabilities." In addition to building the operations center, the Seabees will also build a boat maintenance facility and entry control points with perimeter fencing at Ochakov. On June 30, a federal appeals court upheld a lower court ruling that severs the Penobscot Indian Nation in Maine from the waters of the Penobscot River, a ruling that Penobscot Indian Nation Chief Kirk Francis says is reminiscent of federal termination policy—or worse. “The river and our relationship to it and the 200 islands [that form the reservation] are the core of our cultural identity. If our ability to protect the river is taken away, we lose a big part of who we are,” Francis told ICMN. For decades, the tribe has been monitoring the quality of the water in the river and working with state and federal agencies, power companies and conservation groups to stop the industrial and municipal pollution that has led to unacceptably high levels of mercury, dioxin, PCPs and other toxins in the river. On Monday I began keeping vigil and passing out leaflets at NASA headquarters. Employees and passersby were friendly, but after a half hour the security guards came out and told me I could not stand under the canopy because the whole area there is NASA property. So I was chased out from under the canopy and had to stand in the rain, and the security told me that since I was demonstrating I could not even stand on the adjacent sidewalk without a permit. At 10 am the DC police arrived and pulled up with lights flashing, and the officer went inside to consult with security. Then they left and came back at about 11 am, and the security people came out to talk with them. Still no arrest. In New York City a person can pass out leaflets almost anywhere without a permit, but I don't know if that is true in DC. I believe that NASA -- unlike the White House -- has enjoyed the illusion of being above all controversy, and finds it hard to tolerate even one person who objects to anything they do. Today is the second day of this vigil, and anyone who joins me should know that they are risking arrest. Of course the real crime is that NASA was allowed first to launch space probes with plutonium, and now to crash one of them into the planet Saturn in September, and on top of that they want the Department of Energy to resume production of PU-238 for future space probes. See the most recent newsletter of "Keep Space for Peace," with Karl Grossman's article about Cassini. Former FBI counter-terrorism expert: "The CIA created ISIS"
“We created ISIS. I mean ISIS is no less than the people up in Islamburg, no less then than Gülen. It is a CIA-creation. John McCain, for heavens sake, was over there with the ISIS officials. We created them. They came from Al-Nusra Front, the Syrian Liberation Front. These two organizations combined and they morphed into ISIS. It’s our creation! 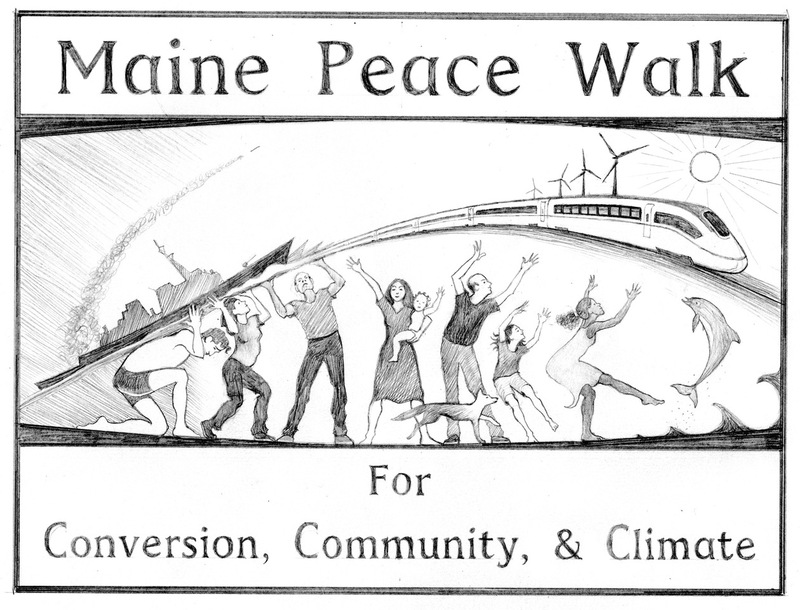 The sixth Maine Peace Walk for Conversion, Community and Climate will be from October 13-21. 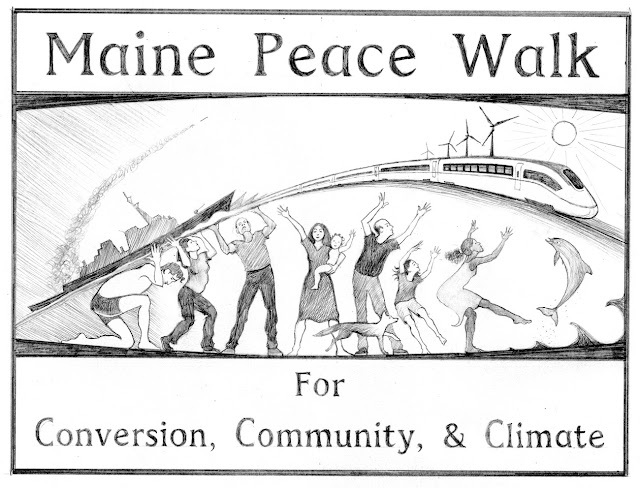 This year the walk will largely be centered in Bath and concentrate on the serious need to convert Bath Iron Works (BIW) to peaceful and sustainable production. As the planet heats up, the oceans warm and acidify, and Arctic ice melts we witness the release of methane that only accelerates the global warming problem. The response of the government has been to unleash geoengineering of the sky which further exacerbates the problem. In addition the US military has the largest carbon footprint of any organization on our Mother Earth. 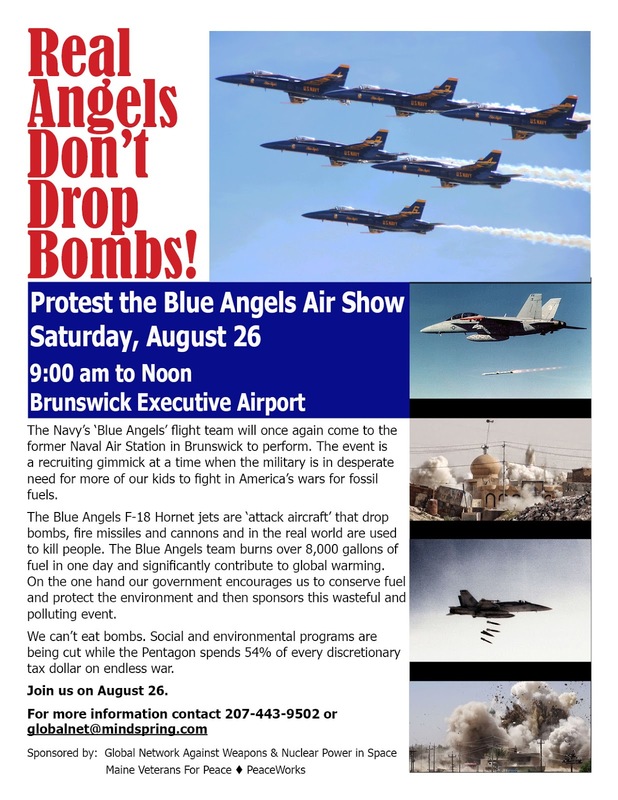 Waging endless war consumes massive amounts of fossil fuels and lays waste to significant environmentally sensitive places on the planet – particularly the oceans. If we have any hopes to secure a future for the coming generations then we must immediately begin the conversion of the military industrial complex to environmentally appropriate renewable energy systems. What could be more important at this moment? Studies at UMASS-Amherst Economics Department have long shown that producing commuter rails systems, offshore wind turbines, solar and tidal power would in fact create more jobs at facilities like BIW than we currently get building warships. Spending on education, health care, and other social programs also creates more jobs than does military production. But if the environmental and peace movements don’t make the demand for conversion it will never happen and our children will be left with the devastating consequences. While in Bath during October 13-21 we will hold morning and afternoon vigils at BIW to bring the conversion message directly to General Dynamics (owner of BIW) executives and shipyard workers. During each day we will go door-to-door across Bath to drop flyers at every house and business in the community. During the evenings a public program, film and music will be featured. We will have a special guest during the peace walk from Jeju Island, South Korea where a Navy base has been built in a 500-year old fishing and farming village that worships their relationship to nature. Gangjeong village was torn apart to construct the Navy base but for the past 10 years daily non-violent protests have been held and they continue to this day. The warships built in Bath are already porting at this new Navy base. We welcome everyone to join our peace walk for an hour, a day, or more and to help in any way you can. Accepting our present condition of endless war for fossil fuels is a dead end street that if not reversed will lead to our collective demise. We must have a conversion that begins with our hearts and extends to the timely task of totally reorienting our national production system. * See this video song by Jeju Island activist Joyakgol. It’s a new song about all the trash coming from US warships porting at the Jeju naval base, THAAD, overdevelopment, nukes and etc.